What is it that good teams do to minimize the number of chances the opposition gets? What do they do to concede as few goals as possible? This briefing looks at one factor which correlates well with the seasonal defensive record – the spatial location of defensive activity. 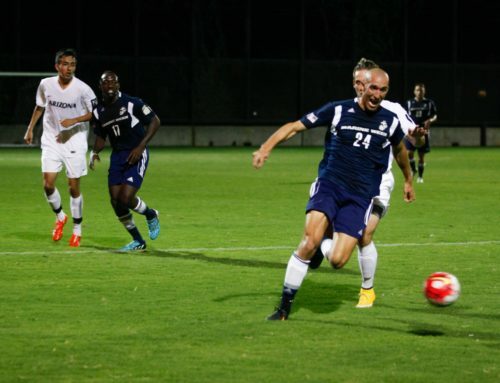 Only these actions occurring in the team’s own half of the field were considered. To get a sense of the metric, the chart below shows the ADDs for European teams in 2010 and 2011. 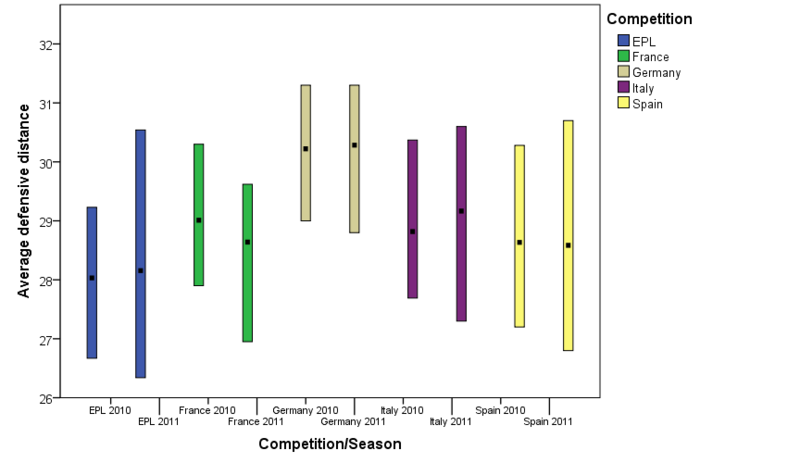 Each bar represents a competition/season. The top of the bar is the maximum ADD and the bottom is the lowest ADD. For example the blue bar at the left indicates that in the 2010 Premiership season, Arsenal had the highest ADD (29.2) and Blackpool the lowest (26.7). Bearing in mind a football pitch is roughly 110 yards long, this means that on average, Arsenal’s defensive actions occurred almost three yards higher up the pitch than Blackpool’s. Incidentally, we can also see quite an interesting difference between the competitions. It looks as if the Germans tend to defend higher up the pitch than everyone else, and EPL teams lower down the pitch, and indeed these differences turn out to be statistically significant. But what is the relationship between ADD and defensive performance? The next two charts give a sense of the overall relationship. Here we plot the ADD for each team against the number of on-target shots conceded and goals conceded. It’s clear from the diagrams that the higher the ADD, the fewer shots and goals are conceded. This impression is supported by the pooled ADD correlations (which correct for differences between competitions and seasons.) For shots conceded the pooled correlation with ADD is -.53 and for goals conceded it is -.47. Average distances are all very well, but they are something of a blunt instrument. 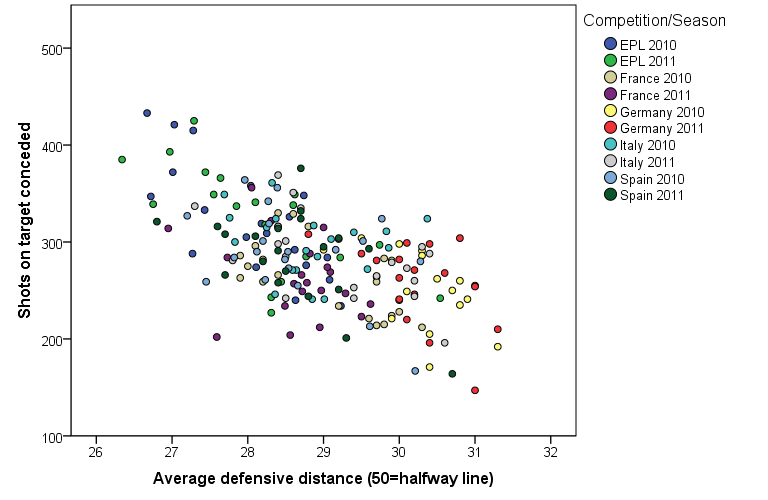 Next we look at defensive distance ‘profiles’, comparing teams with the best and worst defensive records. In the charts below, the three teams with the best defense (fewest goals or shots conceded in a season) are shown in green, and the three teams with the worst defence (most goals or shots conceded) are shown in red. The horiziontal axis represents distance from goal (50 being the half-way line). The data plotted on the vertical http://nygoodhealth.com axis are ‘probability densities’, that is mathematically smoothed curves showing the proportion of defensive actions that occur at each x value. These distance profiles reveal a common pattern. 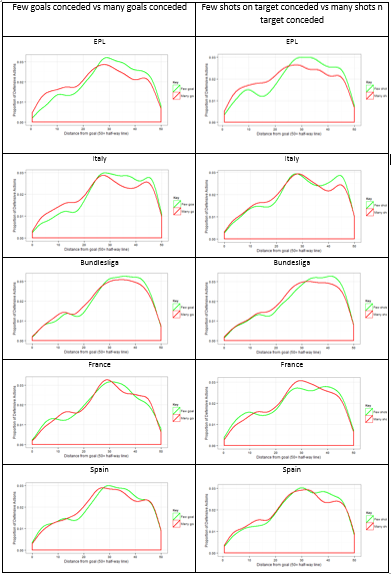 With the exception of France, the profiles of teams with the better defensive records are elevated in the x-region between 30 and 50, and are correspondingly depressed in the region 0-30. A statistical test (the Kolmogorov-Smirnov if you must know) confirms that the green and red curves are generally different. In other words, teams with a better defensive record perform a higher percentage of their defensive actions in the 30-50 area of the field – say between the defensive third of the pitch and the half-way line, and a lower percentage in the region of the field behind that. 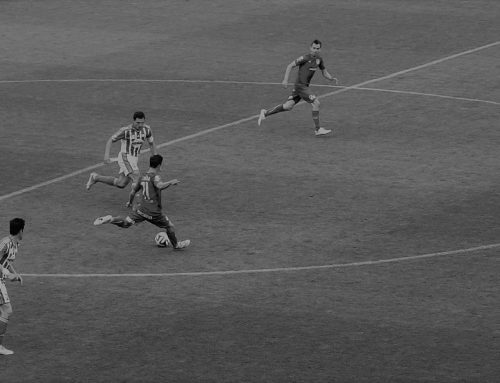 The 30-50 area is traditionally controlled by the defensive or holding midfielder, and it seems that increased activity in this area of the pitch is a key component in protecting the goal. Defensive Distance or number of defensive actions? It should be made clear that so far we have not looked at total numbers of defensive actions, but only their relative distributions in space. But there are differences between teams in the numbers of defensive actions as well. The “green” teams in our charts make somewhat fewer defensive actions than the red teams do. The teams conceding fewer goals perform on average 1183 defensive actions, while the teams conceding more perform 1259 defensive actions; similarly, the teams conceding fewer shots perform 1156 and those conceding more perform 1251. These are modest but statistically significant differences, and in fact there is a positive correlation between the number of defensive actions and the number of goals or shots that a team concedes. For goals conceded the correlation is .31 and for shots conceded it is also .31. Presumably the reason for the positive correlation is that teams conceding more are being attacked more. So could it be the overall number of defensive actions, rather than their positioning, that is associated with the differences in defensive performance? To answer this question I regressed the numbers of defensive actions and the average defensive distances on goals conceded and then on shots conceded. The results were quite clear; the x-positioning of defensive actions (as represented by the ADD) is a much more important predictor of defensive results than the number of defensive actions. The Predictor Importance column shows that for goals conceded, the ADD accounts for 46% of the model variance compared to only 20% explained by the number of defensive actions. For shots conceded, ADD is an even more powerful predictor, and explains 53% of the model variance, while the number of defensive actions explains a mere 8%. This confirms that the ADD, and by implication, the defensive distance profile is the main determinant of defensive performance, not the number of defensive actions. These results suggest that defensive actions in the holding midfield area are critical for preventing the opposition creating chances. 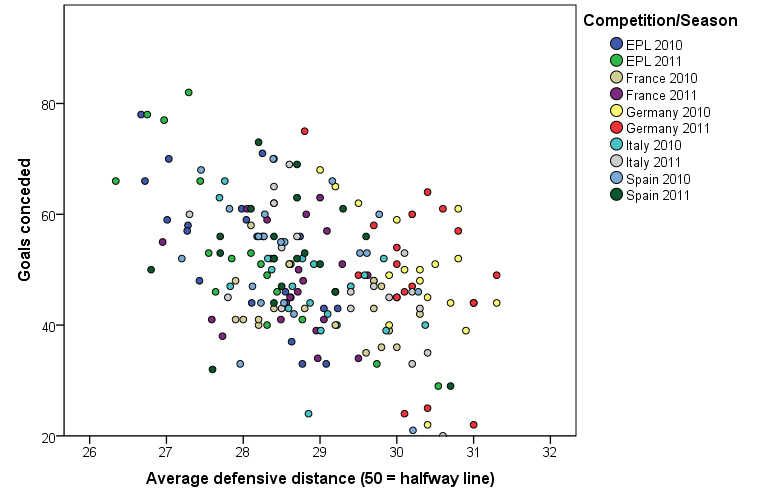 Teams with strong defensive records do a high percentage of their defending in that area of the field. How Lucky is Top Tier English Football?